Two Israeli journalists offer an extremely troubling portrait of the extreme right-wing in their country and the occupied territories—a blend of ultranationalism and religious fanaticism. Ironically, according to Karpin and Friedman, it was only in the wake of Israel’s dramatic Six Day War victory that the ultra- Orthodox became ultra-Zionist. They were aroused by the capture of holy places such as the Western Wall of the temple and the tomb of the patriarchs to insist that Israel not give up any of the land that was promised to Israel in the Bible. Once mobilized, though, this extreme faction began to settle in the West Bank, to engage in acts of violence against Palestinians, and ultimately to virulently oppose Yitzhak Rabin and his attempts at peace negotiations. Karpin and Friedman draw a detailed map of this underground world, with links leading directly to current prime minister Benjamin Netanyahu. The authors make a serious indictment of Netanyahu, not only for condoning at demonstrations slogans calling Rabin a Nazi and a traitor, but for making political hay against Rabin out of a terrorist attack within Israel. The authors then train their lens on Yigal Amir, Rabin’s assassin, and show how this son of modest Yemenite immigrants became convinced it was his mission to save his people and his country by killing Rabin. 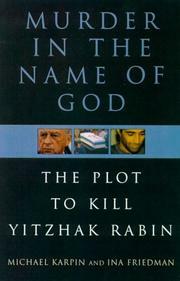 Most disturbing is the chapter on discussions among rabbit on the extreme right of whether to consider Rabin a rodeph, in Jewish law someone who endangers the lives of fellow Jews ; such a person may be killed to save Jewish lives, and Amir relied on this notion in justifying his murderous act. A much needed portrait of a dissident faction within Israel that seeks to retain the occupied territories at any cost.